Our online Event Registration System is a powerful feature of MemberLeap, the Membership Management System. 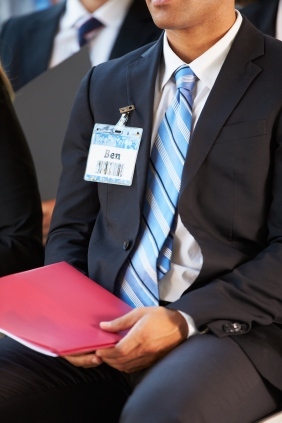 Whether you are organizing a small meeting or a major convention, the Event Registration System will allow attendees to register and pay for the event online. You can set up the registration form to include a variety of custom fields, collecting information such as meal options and additional sessions. During the event, you can use the system to check in attendees, and use a variety of standard and custom reports to aid your procedures. You also have an option to manually enter registrants who mail in payment or phone in their registration info. Attendee Tracking - Admins can keep track of who has signed up for what event as well as who has paid their fees. You can also keep track of who has attended particular events (not just signed up) and record things like CEU hours from event to event. 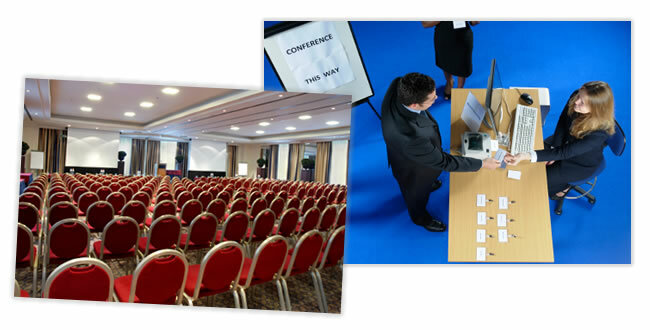 Event Packages - This module offers differently priced attendee packages. Early registration packages can be set up with a discount. Packages can be set up for members only or available to non-members. Additionally, you can make packages for specific types of members only that are inaccessible to others. Cut-off Dates - Admins can set up cut-off dates for registration or for particular event registration packages. 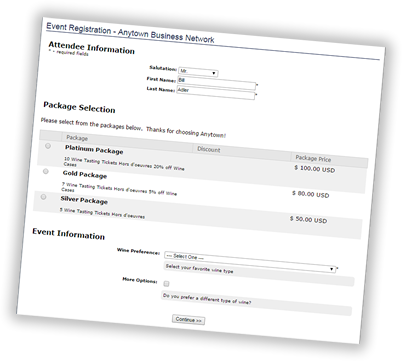 You can set begin dates on the event and on packages as well as cut-off dates on the event, packages, and custom fields. This will allow you to set up an automated system that makes things available and unavailable according to the date structure you specify. Set up the event once and let it run! Discount Codes - These codes offer discounts to vendors, donors, and others by setting up codes with percentage or dollar-based discounts. Codes can also be limited to members only and can be easily copied from one event to another. Custom Fields - All events are different, so this module allows you to set up a variety of custom fields to collect information specific to your event (i.e. opt-in training sessions, breakout sessions, banquet meal type, t-shirt size, etc.). These fields can be restricted to specific member types or to specific packages and only appear when appropriate. You can also create dependent fields that are only shown if their parent field is selected. Admin Fields - Admins can keep track of different pieces of admin-side information on each registrant, hidden from the registrant's eye (i.e. attendance at event, hotel room number assignments, exhibitor booth space number, etc). Members Versus Non-Members - You have many options to offer different things to your members and non-members. Entire registrations can be members only, or packages and/or custom fields can be limited to members, guests, or both. You can make a single registration that could potentially look completely different to non-member than it does to a member. NEW FEATURE! File Uploads - If you need registrants to upload a file during registration or if you require students to provide proof of their education status with a transcript in order to receive a discounted rate, they can upload their documentation during the registration process. Billing/Collections Tools - Several tools can be used to follow-up with registrants that have not paid fees. These include past due reports, invoice reports, and others. You can get this information about a single event, or you can do cross-event reporting. Banquet/Table Registration - These tools allow the registrant to register for full or partial tables and offers easy entry of table guests. Online Payments - You can collect event payments online via Authorize.net, PayPal or a credit card merchant account of your choice. Reporting Features - Admins can produce attendee reports, sessions/breakouts, attendee name badges, mailing labels to send packets or other information to registrants, and more. Data Export - Attendee data can be exported from the system in a comma-delimited format for use in other software packages. Recurring Events - For monthly or other periodic events, the system can be set up to copy the event information automatically, making maintenance much easier. Broadcast Email Messaging - This built-in feature allows you to quickly send an email to all attendees. You can choose to send it to all attendees, pick and choose specific ones, or narrow down your results based on a custom query. Surveys - You can create a custom survey (i.e. quality of the presentations, comfort of the room, quality of food, etc.) by adding various questions (multiple choice, text, multiline text, 1-5 rating, etc.) and then use the broadcast email message module to send it to all your attendees or only those that you select. Copying - You can make a copy of an event and then just update it for the following year. If you have a major conference each year that has a lot of fields and packages, you are able to make a copy of it and use that as a starting point for a new event, saving time on data entry and event set up. Attendee Management - You can not only view what each attendee has chosen, but you can change their options, add new ones, enter payments, and even manually add attendees. Event Admins - Admins have full access to everything in the module. But, you can grant members 'partial admin access' to specific events without making them a full admin.